It's the moment every gardener dreads - you walk out to enjoy your beautiful garden and are met by plants that have been so chewed up that they are unrecognizable. 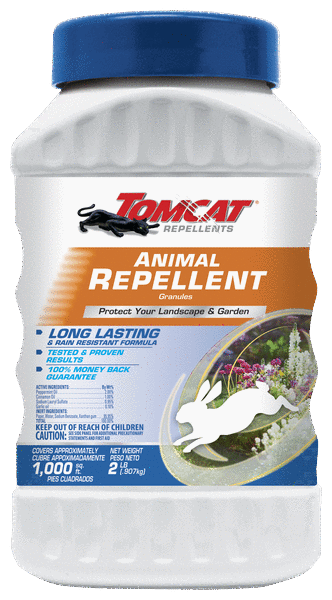 Tomcat® Repellents Animal Repellent Granules protects your landscape and garden from this greenery assault. The smell and taste of Tomcat® Repellents Animal Repellent Granules is unpleasant to animals like rabbits, squirrels and groundhogs. Its long lasting, rain resistant formula is safe to use on edible fruits and vegetables as well as around people and pets when used as directed. 2 lb. covers 1,000 sq. ft. Remove seal under cap, and replace shaker top. Hold bottle with shaker top pointed forward and down. Shake bottle side to side to dispense. Liberally apply to turf and soil around flowers, ornamentals, shrubs, fruits and vegetables, making sure to apply evenly around the plant or area. (2 lbs. will cover up to 1000 sq. ft.) This product should only be applied around plants which do not grow above a height of 18 in. Bulb Protection: After placing bulbs in planting hole, apply 1 tablespoon into the hole, making sure granules surround the bulb, then backfill with soil.